Evanston residents paid tribute Saturday to Dajae Coleman, a 14-year-old boy who was killed in the 1500 block of Church Street. 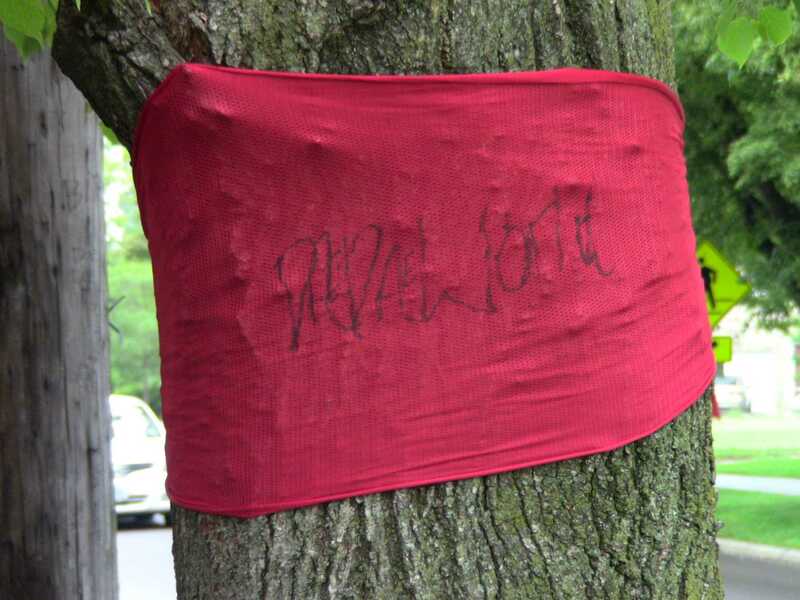 "Dae Dae World" is written on a red cloth on a tree near the site of the fatal shooting last fall. Rice partnered with Hecky Powell, founder of the Forrest E. Powell Foundation and owner of Hecky’s Barbecue, 1902 Green Bay Road, to set up the foundation in February. The foundation offers a scholarship called the “Dajae Coleman Achievement Award” to a student at the end of freshman year and will also organize “Dae Dae World Weekend” to mark the one-year anniversary of Dajae’s death in September. Rice said she plans to work with the Evanston Public Library to start an online book club focusing on the four books Dajae had checked out before he died. She said she also hopes to prepare teens for life beyond high school through a program called “College Bound Ready,” which educates students on skills they will need when they leave home, from balancing finances to washing laundry. Maura Bowen, youth minister at the First Church of God, said the programs will engage young people in a community that does not always find ways to do so. “(They will get) Evanston youth back together where they learn to appreciate life more and value the things Dajae valued,” said Bowen, a member of the foundation. Evanston residents, including Mayor Elizabeth Tisdahl, posed in front of the basketball jersey Dajae had worn playing in the Evanston Pride Feeder Basketball program. The programs started by the foundation embody Dajae’s energy and drive, his father Richard Coleman said. Dajae’s grandfather Michael Rice said the outpouring of community support following the teen’s death is a testament to his character. Assistant summer editor Edward Cox can be reached at edwardcox2011@u.northwestern.edu. Follow him on Twitter at http://www.twitter.com/EdwardCox2016.